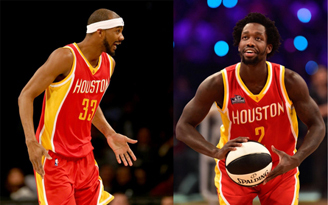 As most expected, the Rockets decided to bring the band back together, signing Patrick Beverley and Corey Brewer to multi-year deals over the holiday weekend. Considering signing LaMarcus Aldridge was a pipe dream — and a rather expensive one at that — this was really the only logical move for Daryl Morey this offseason. No point guard on the free agency market fits the Rockets better than Beverley, and there might not be a bench wing on earth who fits the Rockets better than Brewer. He was indispensable in the playoffs, and Beverley was missed. It sure helps that they’re both so cheap, too. Beverley is back at four years, $25 million with the last $5 million unguaranteed. Considering Cory Joseph just got paid $5 million more and might be a Spurs-ian illusion, this is an incredibly fair contract. Next year when the salary cap is close to $100 million and the Rockets have a 27-year-old point guard who plays haranguing defense and can knock down open three-pointers making a shade over $6 million, Morey will look like a genius. Again. Corey Brewer will be making more, entirely deserved, money. He signed a three-year, $23 million deal, which, again, at less than $8 million a year, will be a steal next year. Heck, it’s a steal this year, because he was able to take over games for stretches against opposing bench units and score single-handedly in the fast break. I argued he should have won Sixth Man of the Year, and had he played the whole season in Houston, he might have taken it home. He should be a leading candidate for the award next year. Next year, the two will combine to make roughly $14 million a year, or $1 million less than Chandler Parsons. Corey Joseph is making $5 million more over the course of his deal. Al-Farouq Aminu is making just as much as Brewer. In the current market, Morey got his role players to take discounts. There are event reports out there that Jason Terry wants to come back, and the Rockets are as yet unwilling to sign him (not a bad decision). Since the Rockets haven’t renounced the cap holds of Josh Smith and Jason Terry, as far as I can tell, meaning they’re still $8 million over the cap, according to Spotrac’s cap tracker, the only way they can sign Smith is if he signs for pennies on the dollar contract and sign K.J. McDaniels for a part of their mid-level exception (he’s not taking a David West discount). So the team is largely back together, save for the last few pieces, but the roles will slightly change. Sam Dekker will find some minutes, Donatas Motiejunas figures to get at least 30 minutes of run a night, Clint Capela deserves to play more and Terrence Jones, if he’s still on the team, will have a chance to prove he can still make a positive difference after another horrific playoff performance. Morey has his last few moves to make. He needs to sort out the McDaniels/Smoove situation, and it still seems he has a trade to make. He has Kostas Papanikolaou’s contract, Terrence Jones, four young assets in Nick Johnson, Clint Capela, Sam Dekker and Montrezl Harrell and future picks. The Rockets may be over the cap, but they are far from inflexible. There is still so much offseason left. Almost all of the major free agents have signed, yes, but don’t forget three years ago, when just days before training camp started Morey pulled off the most lopsided trade in the last decade and landed Houston an MVP. We know he will continue to work the phones, and find ways to improve. Although Nick Johnson showed promise last year as a defender and has A-plus athleticism, with Beverley’s injury history, the Rockets simply must add another point guard. Who knows if Pablo Prigioni can hold up (his contract is unguaranteed, but very cheap) to another full season? Same goes for Jason Terry. It’s conceivable neither or both of them could be back next year. No matter what moves Morey makes, his first two were both quiet successes. The game’s best GM is just humming along, knowing he has a contender in his hand with cards still to play.